First of all, being in the states during the holidays and partaking in holiday baking brings me so much joy! Second of all, I've recently discovered the most amazing, fantastic use of my torte pan set and feel like I was truly 'inspired' over the holidays to make some new, delicious desserts, inspired of course by pies. Since it was Thanksgiving, and I had recently acquired some happy little squash and pumpkins I went for a pumpkin-pie inspired torte. Additionally, since we were going to spend the holiday with my fantastic parents, and I knew that my mother loved lemon meringue, I decided to let that be the inspiration for the second torte. Next up was making cakes in my torte pan, a pumpkin-cream cheese filling, lemon curd, purchasing whipped cream and marshmallows and hitting the kitchen! Set 3/4 cups butter and 3 eggs out for 30 minutes until they reach room temperature. Grease and flour two torte pans. Preheat oven to 375 degrees F.
In a large mixing bowl combine 2 1/2 flour, 2 1/2 tsp. baking powder and 1/2 tsp. salt, set aside. Beat butter on medium speed for about 30 seconds. Gradually add 1 3/4 cups sugar and continue to beat for 2 additional minutes. Add eggs, one at a time followed by 1 1/2 tsp. vanilla. Alternately add 1 1/4 cup milk and flour mixture until combined, split between pans. Bake 20-25 minutes until golden brown and a toothpick inserted comes out clean. Cool for 10 minutes, remove from pans. Fill as desired. Note: If you are making the Pumpkin Cheesecake Torte, I recommend adding spices such as nutmeg, cinnamon, cloves and allspice to the batter. On the other hand, if you're preparing the Lemon 'almost' Meringue Pie Torte, I recommend adding a teaspoon or so of lemon zest to the batter, for added depth and flavor. I simply mixed about 1 or 2 cups of Pumpkin/Squash Puree with soft cream cheese, added some brown sugar and spices such as cinnamon, nutmeg, cloves, etc. 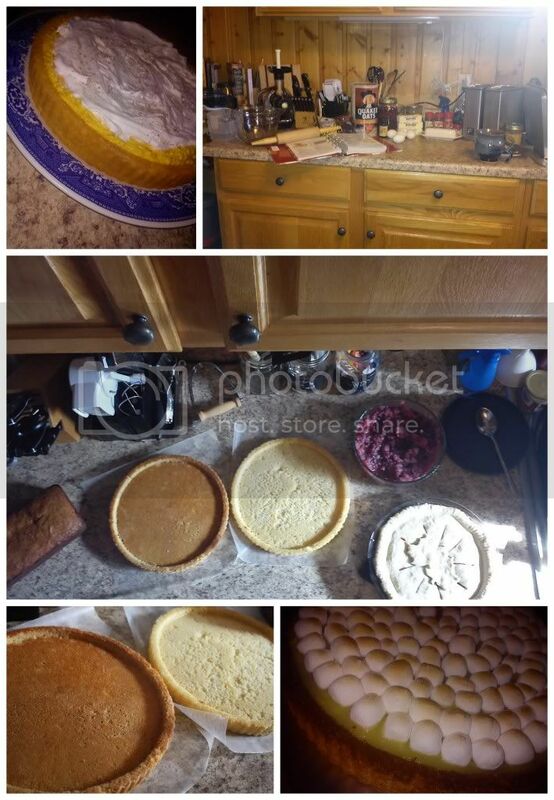 However, I recommend looking for a more precise pumpkin cheesecake dip/filling to ensure the best, fullest flavor. For some good ideas on where to start, scroll through this page I created on Squidoo, you'll find some of the best pumpkin cheesecake dips on the web! To assemble the Pumpkin Cheesecake Torte simply plop the filling into your torte cake, spread some whipped topping on top and sprinkle with nutmeg, you're good to go! Buy or prepare Lemon Curd. Fill torte cake with lemon curd, arrange mini-marshmallows over the top in any design or amount you want to, turn on the broiler and place your marshmallow covered dish under the broiler for 3-5 minutes (they'll burn quickly...which we actually think tastes quite nice, but for presentation, golden is better). The marshmallows will get toasty and melty and you'll have an extremely delicious and tart dessert to share with all your favorite people!